Recreation facilities at Menninger Clinic were available to staff during times when they were not used for patients. This supported a strong wellness and exercise program for the staff. The Menninger philosophy of an integrated medical, psychodynamic, and developmental approach for the total health of patients extended to the employee policies. 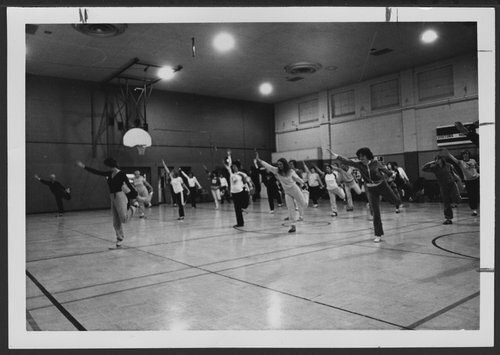 Staff recreation at Menninger Clinic in Topeka, Kansas - "Flamingo fling" is the name of the step being practiced by members of an aerobic dance class in Hopkins Gymnasium. About 50 Foundation staff members are enrolled in the class taught by Leigh Langdon, AT.